CUA toilets are actually neither composting nor incinerating -- they are evaporating toilets. Both systems are innovative non-discharge dry sanitation systems which can be used wherever sanitation is needed, without water and without polluting the environment. 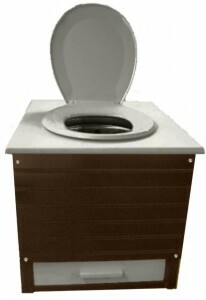 These alternative toilets can be used in a wide variety of locations, including hunting and fishing cabins, parks, schools, acreages, camps, public buildings, military outposts and training areas, areas of natural disasters, shoreline settings, recreational fields, municipal public sites, as a replacement for failed septic systems, and anywhere else that a commode or privy is needed. The Eloo and the Sanitizer™ are environmentally friendly, easy to maintain, and can be used wherever bucket, pit, chemical, or composting toilets or port-a-potties might be used. The Sanitizer is an evaporative toilet that is heat-assisted to accelerate the process. It's a very effective toilet, without the downsides of either composting nor incinerating. The Sanitizer™ Toilet is a compact, non-polluting, waterless, self-contained, evaporative toilet which reduces human waste to a lightweight, odorless, sanitized form, without the use of water or chemicals, that is easily discarded with household trash. The Sanitizer™ Toilet is a compact (29” w x 17” d x 21” h) self-contained toilet that is ideal for homes, buildings, recreational vehicles, and other locations where traditional sanitation is unavailable or impractical.The Sanitizer’s small size makes it easy to locate it exactly where a toilet is most needed, and it requires no water or chemicals, no sewage or drain hookups, and no pumping or dumping! It is easy to install and maintain, and it runs with a small amount of household current. The Sanitizer™ is an ideal solution wherever traditional sanitation is unavailable or impractical. The Enviro Loo, or “Eloo“, is another non-polluting, waterless, evaporative toilet system that has been used worldwide as an effective solution to the sanitation challenges presented across the globe. The Eloo is a waterless, zero-discharge onsite treatment system for human waste.The Eloo provides an environment which treats and stabilizes human waste via dehydration and evaporation into an inoffensive and harmless material, without the use of water or chemicals. The Eloo has a very large capacity and has been used successfully at beaches and resorts with frequent and high levels of use, as well as private homes and cabins. The Eloo system is very low maintenance and, because the treatment process quickly and substantially reduces the volume of waste, only needs emptying every 6 months to three years. The Eloo is a passive system; it uses no electricity and works with the natural solar heat and currents that result from its unique design. Over 100,000 of these amazing non-polluting toilets are currently in use worldwide.